The Abnett/Lanning writing duo continues. The phrase techno-organic entered the Marvel dictionary via various X-titles. Originally it referred to Warlock (not Adam) and the rest of his Technarchy alien race. Later a Techno-Organic Virus was revealed to be responsible for at least some of the powers of Apocalypse and Cable. Dreamguard and Orphan have not been seen again, but Dreamguard did get an entry in the 2010 Avengers Assemble Handbook. As mentioned last issue Wonder Man's memorial took place before the main story in last issue and this. Next Iron Man will join many other (non-FW) Avengers in the 2-issue crossover with Malibu Comics' Ultraforce (Avengers/Ultraforce and Ultraforce/Avengers), and then he'll attend Mr Fantastic's (premature) memorial in the backup tale in Fantastic Four #400. He helps Cap stay alive in CA#437 at the end of the Fighting Chance arc, while the rest of Force Works help fight the Serpent Society. Then he and Giant-Man create a bionically-controlled exoskeleton for Cap in IM#314 and CA#438. 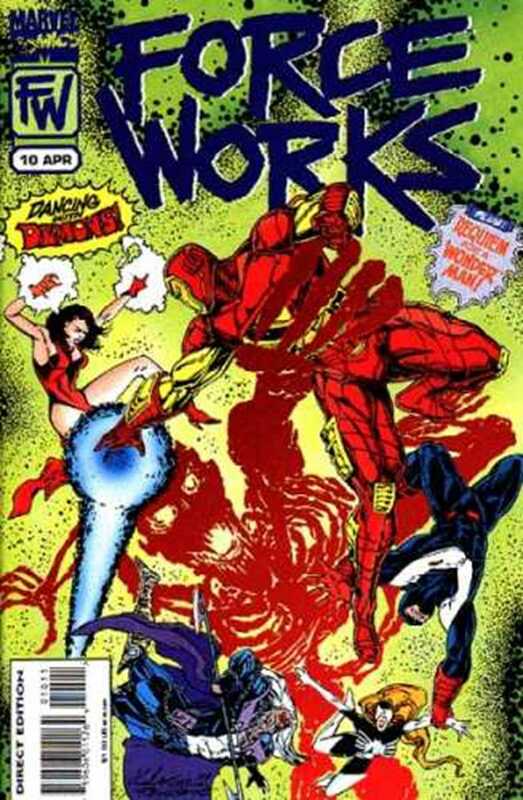 He and Black Widow fight Titanium Man in IM#315-317, with a cameo from Force Works in the last issue. Then he has a quick battle with 1-off villain Slag in IM#318. And Scarlet Witch gets a phone call from War Machine in Slorenia (WM#14) which leads the team directly into its next issue. Force Works are in Australia where they've been fighting monsters literally out of someone's nightmare. Police Deputy Willie Walkaway has used his aboriginal knowledge to lead them to the source of the problem when they were attacked by a giant skeleton. Now he finds himself seemingly millennia in the past. But a voice in his head claims the name Orphan and says that this is Dream-Sight. Willie sees a small spaceship fall from space. Orphan says their Mothership had died, but now this escape vessel crashes and its living occupants die also. But Orphan the ship itself survived, buried in a crater. Long ages later Australian natives sensed his presence and made it a sacred place. And Orphan turned their dreams into reality. But Willie tells Orphan that someone is now abusing his power. Alf Robbins and Shane Mundy slept in the sacred Gowanga Gorge. Alf is just a drunk whose DT's materialised as monsters. Shane is a psychopath whose giant skeleton attacked Force Works in their Works Wagon. Walkaway persuades Orphan to return him to reality so he can make sure they're OK. He finds the wreck of the Wagon, and Alf dead of fright. But no sign of the FW. We see Iron Man alone and unable to contact the others. Suddenly the ground all around him sprouts techno-organic growth which quickly overwhelms him and takes over his armour, entombing him within it all. We see Spider-Woman on a giant spider-web where her daughter Rachel Carpenter is cocooned. And then the Scatter bugs from #1-3 overwhelm *her*. We see Century alone, but then surrounded by negative images of himself (representing the multitude of minds he somehow contains?). *They* then engulf *him*. Scarlet Witch is not alone in *her* barren environment. But the Force Works teammates with her claim that she's delusional when she says everything's changed. And they tell her that her bad decisions will get them all killed. U.S. Agent has reverted to childhood when the Bogey Man that his father denies exists comes out of his closet to get him. But young Jack fights back with his fists, and suddenly he and the rest of the team reappear around Willie Walkaway, freed from their nightmares. They all climb down the inside of the crater. Century's staff Parallax detects rising energy, and Shane Mundy's giant skeleton attacks them again, along with the monsters he's borrowed from the nightmare of now-dead Alf. Battle commences and our side is having a hard time of it. Except US Agent who concludes that his escape from his nightmare has granted him some immunity. Walkaway says they've got to break Shane's link with Orphan. USA decides that *he*s the man for the job, but the Witch sends the Spider after him as backup. They find Mundy glowing with energy but in a coma. Jack tries to wake him but becomes stuck even as the energy racks his body. Spi tries to pull him free with her psi-web, but that just conducts the dream energy to *her* too. The backup tale this issue, called Sense Of Loss, is again by the regular team. It takes place during the memorial service for Wonder Man. Century is standing apart from the ceremony because he feels it inappropriate to intrude since he never knew Simon Williams. Amanda Chaney joins him, possibly for similar reasons. He tells her he also feels responsible for his death (in #1) because the alien Scatter followed him to Earth, and by chance destroyed the Kree starship which led to Wonder Man's self-sacrifice. Amanda says "Can I be frank with you?" (which leads to another misunderstanding because he thinks she wants him to call her by a different name) and tells him to stop feeling sorry for himself. It wasn't his fault, and since then he's helped the team enormously. The best thing he can do is honour Simon Williams' memory by doing his best to fill his shoes. After it's all over Happy Hogan drives the team back to Force Works HQ. Some of them think of their own losses. Wanda Maximoff remembers her 2 children with Vision who turned out to be figments of magic. Julia Carpenter mourns her failed marriage and the death of her ex-husband. Tony Stark misses his latest ex-girlfriend Veronica Benning. It seems none of them know that Jack Daniels/John Walker saw his parents murdered by the Watchdogs. 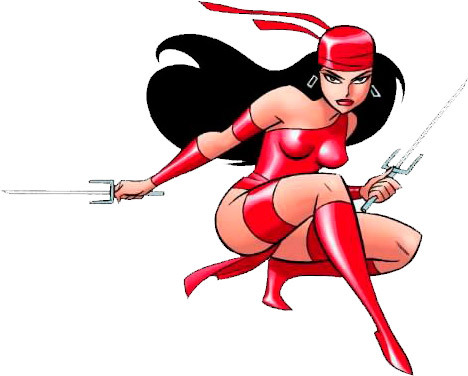 Plus: Amanda Chaney, Century, Dreamguard (Willie Walkaway), Happy Hogan, Spider-Woman (Julia Carpenter), U.S. Agent.